Herne Bay community group, the Greenhill Senior Citizens Club, recently presented a cheque for £440 to Pilgrims Hospices. The club, who are regular charity fundraisers, are generous supporters of a number of charities throughout the year. The kurling group who host a weekly raffle for members nominated Pilgrims Hospices to receive the funds raised. Thank you for choosing to support our hospices. Pilgrims Hospices was chosen as the charity for the kurling club as a number of the members had experienced Pilgrims care and wanted to enable others to experience the same care they’d been lucky enough to receive. “Pilgrims would like to say a huge thank you to all of the club members for choosing to support our hospices. Their contributions will really help to make a difference to those who need our help right now.” Lydia added. If you would like to find out more about fundraising for Pilgrims Hospices please contact our fundraising they would love to hear from you. 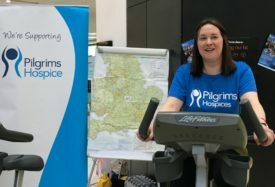 This year alone, Pilgrims Hospices has to raise £11 million through voluntary donations in order to run our full range of services. 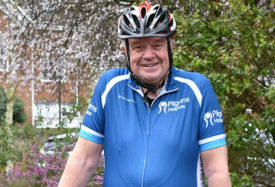 Sponsorship raised through events like these helps us to continue caring for local people at the end of their lives.